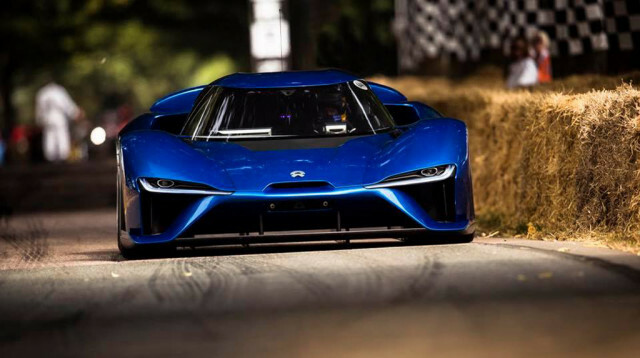 Nio EP9’s electric hypercar has set the fastest time for a street-legal car in the Goodwood Festival of Speed’s famous hill climb. The car ran a time of 44.61 seconds during Saturday’s Supercar shootout event, which eclipsed the previous time of 47.07 set by a McLaren P1 LM by Lanzante in 2016. Doing the driving was Scottish racing driver Peter Dumbreck. The overall record still stands at 41.6 seconds, set by Nick Heidfeld in a McLaren MP4/13 Formula 1 car back in 1999. We should point out that the EP9, like the P1 LM, isn’t a regular production car, as just 16 examples are planned. Also, the car’s street-legal tires were swapped out for racing slicks for this weekend’s hill climb. Still, the EP9’s run was incredible and a true sign that electric cars have the potential to rewrite the rule book on performance. We’ll remind you that EP9 is also one of the fastest cars around the Nürburgring. It set a time of 6:45.90 around the Green Hell in 2017, which for a street-legal is second only to the 6:43.22 set by the aforementioned P1 LM also in 2017. For readers unfamiliar with Nio, it is a Chinese electric startup that aims to become a mainstream brand worldwide. After securing the inaugural Formula E Championship title, Nio set out to build the EP9 electric supercar. The car features four electric motors delivering a combined 1,342 horsepower and 1,091 pound-feet of torque. The power is enough to rocket the EP9 from 0-60 mph in 2.7 seconds to a top speed of 195 mph. Following the supercar, Nio unveiled its first mass-market vehicle, the ES8 electric SUV in China last year. Starting at roughly $68,000, the electric SUV returns an estimated 220 miles of range with its dual-electric motors and 70-kilowatt-hour battery pack. Nio also has plans to offer battery swapping in as little as three minutes. Such a service would render the ES8’s electric driving range limitations moot. Of course, the company has to build the infrastructure to make that service viable. Deliveries of the SUV will begin this year following some final testing, Nio said this month. As for the EP9 supercar, Nio originally intended to build six examples with a price tag of $1.48 million each. However, last year, the Chinese brand said it would build 10 more. It’s unclear if any copies will ever make their way to the United States. Future models are planned for sale here, though. For more from the Goodwood Festival of Speed, head to our dedicated hub. ‹ Previous Nikon 500mm f/5.6 Spotted. It’s TINY! The CrackBerry UNSTOPPABLE Tour is coming to Canada next week — Here's the info!